Two weeks ago I spent a week in Illinois visiting my children. 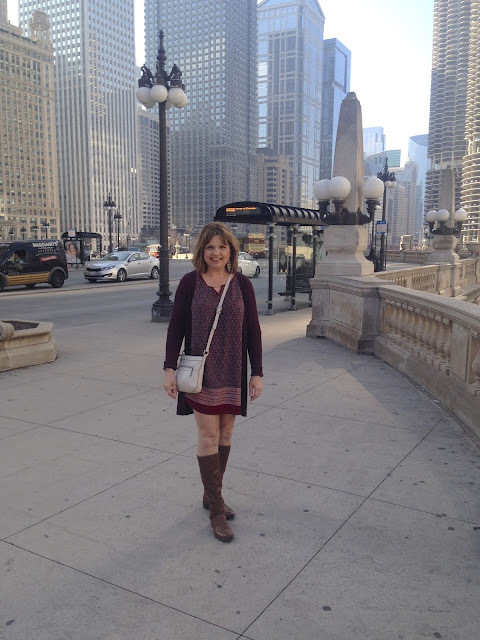 One of those days we went shopping on "The Magnificent Mile": one of my favorite places on earth to shop! 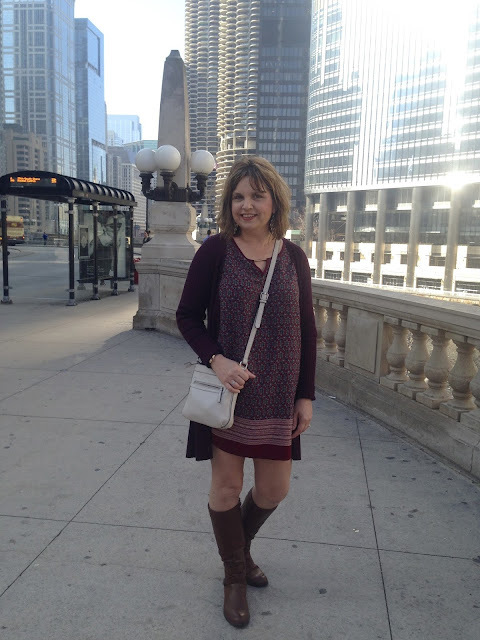 It was a beautiful seventy degree day (very unseasonably warm for a February day in Chicago) and this is what I wore. I wore an comfy old shift dress I've shown you twice before HERE and HERE. 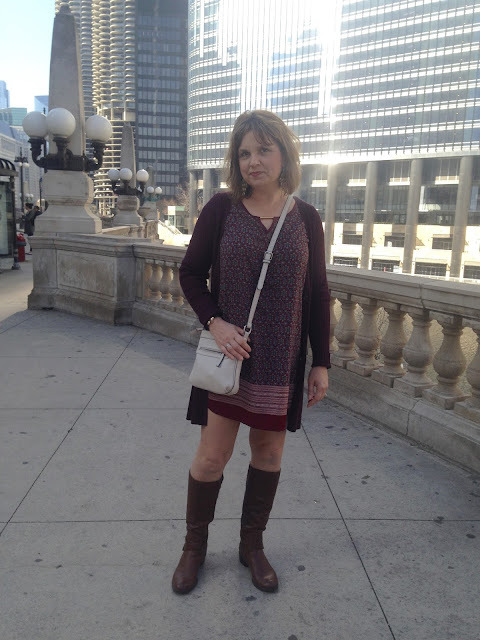 This time I styled my dress with a long burgundy cardigan from Worthington and tall cognac boots. The cardigan is a little longer than the dress, so it provided nice coverage in the back. Because I was traveling I carried a cross body bag. I wore the same gold statement earrings I've worn with this dress before because they just go so well with it! I think we did mostly window shopping, although I did buy a few trinkets. My daughter found a lot at the HUGE Forever 21. They had a 60% clearance sale and she ended up with a bagful of clothes for $16.00. Unbelievable! What a perfect outfit for the occasion!! How lucky you were that it was so warm! Bare legs---yippee!!!! Thanks Jodie! Yes, I really lucked out with the weather that week. I bet your children are so proud of their stylish, fit mama!! Thank you, yes, I love Chicago! One of my favorite cities! So cute! I love the longer cardigan with the dress. Great layering piece and great option for more coverage! Chicago has been on my bucket list forever!! I love this look, and of course that bag is so cute too! Perfect color for spring. Oh, and to answer your question you left on my blog...I actually didn't see La La Land...just snapped some pics in front of the theatre :) But I heard it is good! Oh, you have to get to Chicago! I've been to most of America's major cities and I think Chicago is one of the best! So pretty, and so much to do there! The dress looks great with the long cardigan, Amy! Looks like you had a nice visit with your children! I like that it was warm enough for this dress. I need to visit Chicago again some day. Haven't been since high school years. Yes, it was a rare warm winter day! It was awesome! Perfect for walking around Chicago! It can get windy there even when it's warmer so the cardigan was a great idea! Love the burgundy colors in your outfit! Thank you! Yep, it was windy, I had a hard time keeping my dress down. Hi Amy, so cool your children live in Chicago - one of my absolute favorite US cities. Love this printed dress and how it is styled. Monochromatic yet with a lot of details. =) I purchased a similar dress from Wal Mart of all places, lol. Thank you, my kids actually live in a suburb of Chicago about 45 minutes away. Sounds like a fun day! Love the purple on you and shift dresses are favs! Thanks Jessica! It was a fun day! 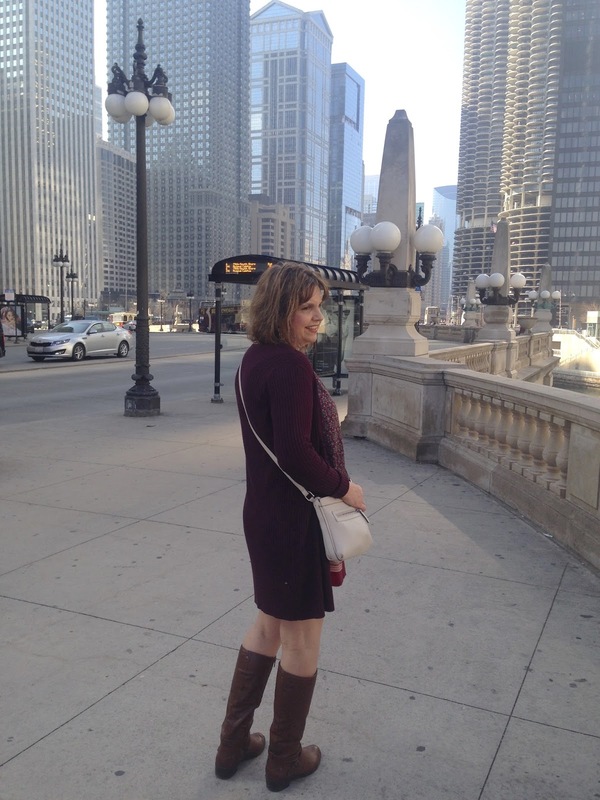 What a darling dress and oh how I love Chicago!! Thanks Andrea, I love Chicago too! I love the print of your dress and the long cardi layered over it! Glad you got to enjoy the 70 degree weather! It's back in the 20's today!